Based on the recommendations from our consultative workshop, CanIMPACT will be evaluating a secure online asynchronous communication platform (Champlain BASE eConsult) for healthcare providers of cancer patients. 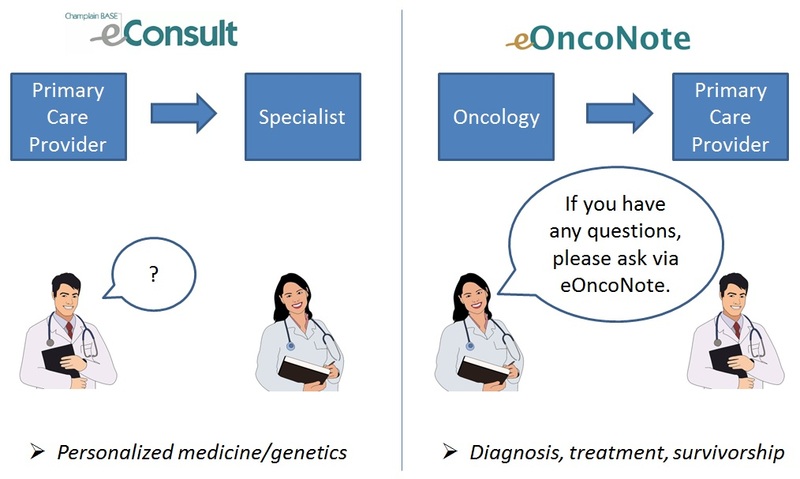 The CanIMPACT intervention will be a modification of BASE eConsult, referred to as eOncoNote, and will involve the patient’s cancer specialist initiating communication with the primary care provider by extending an invitation to ask questions related to the patient during diagnosis, treatment and survivorship phases. For the personalized medicine component, we will use the traditional BASE eConsult. Newfoundland and Labrador, where eConsult was more recently introduced. This novel approach of utilizing an existing asynchronous online system may assist primary care providers, cancer specialists and clinical geneticists to better coordinate their patients’ care. We will examine the effectiveness of utilizing eOncoNote and BASE eConsult on patients’ perceptions of informational continuity of care and patient experience of care, as well as barriers and facilitators to implementation in the oncology and primary care settings. The pragmatic randomized controlled trial of eOncoNote in the Ottawa region was launched in February 2018. We plan to recruit a total of 264 patients; 88 from each of diagnosis, treatment and survivorship phases of cancer care from The Ottawa Hospital Cancer Centre. This mixed methods study will include: patient questionnaires, usage metrics, hospital data, primary care provider surveys, and interviews with patients, primary care providers, cancer specialists, managers and administrators. The implementation study in Newfoundland and Labrador was launched in October 2018.